The best laser tag Birthday Party place in Pittsburgh is your BACKYARD!! Steel City Gamerz brings the ultimate laser tag experience to you! Be the first in your neighborhood to host the coolest boy or girl laser tag birthday party ever! Our laser tag equipment can be used day or night so we can party all day long. Get to have all the fun and excitement of laser tag and paintball combined into one, without having to deal with other parties or the pain and mess that coincides with paintball. 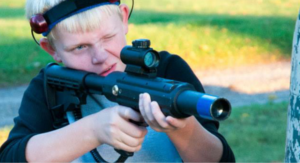 Our ” DRILL SEARGEANT ” will arrive 30-60 minutes early to customize the ultimate laser tag battlefield in your backyard! He/She will setup barriers, select teams, calibrate guns and ensure the kids will have the best laser tag experience in Pittsburgh! Our laser tag equipment is safe for everyone! The taggers “shoot” a harmless infrared beam ( similar to a remote control ) Our mission is to create a safe/fun gender neutral environment that’s fun for all ages! Simply use the BOOK NOW tab and we will contact you ASAP! Please understand weekend inquires may be slightly delayed. Suggest amount of children is 10-15 participants with the ability to rotate children in order to take a slight break in the action! !!! YOUR BACKYARD IS OUR BATTLEFIELD!! !